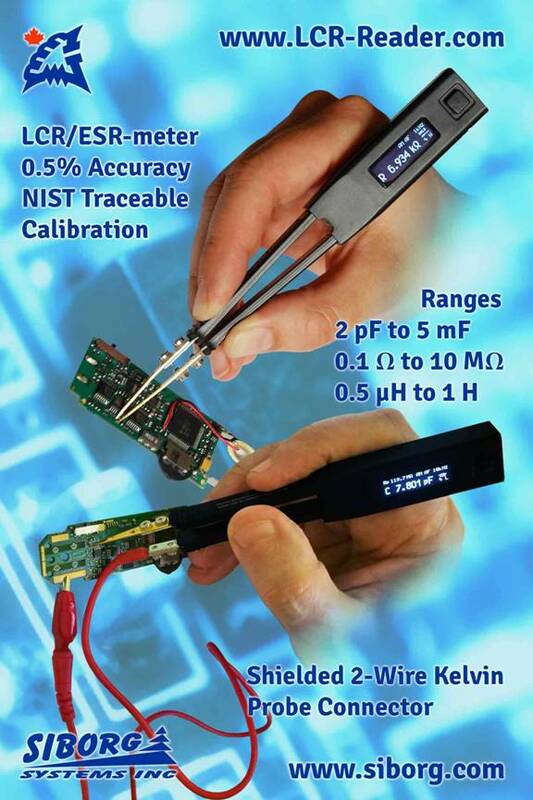 LCR-Reader, LCR-Reader-MP, Smart Tweezers and Kelvin Probe Connector from Siborg Systems Inc. Starting Wednesday, June 27, 2018, Siborg is hosting a sale on their LCR-Reader multimeters, including the new multipurpose testing device, the LCR-Reader-MP. The sale will run in the LCR-Reader Store until July 6th, 2018. The LCR-Reader line of multimeters save time and effort while testing SMT with fully automatic identification and measurements; the device identifies the component and best test parameters when in contact with a component. The LCR-Reader family requires no set-up between measurements and offers high accuracy. All measurement values, including the main impedance, secondary impedance (e.g. ESR), test frequency and test mode are displayed on the device’s screen. 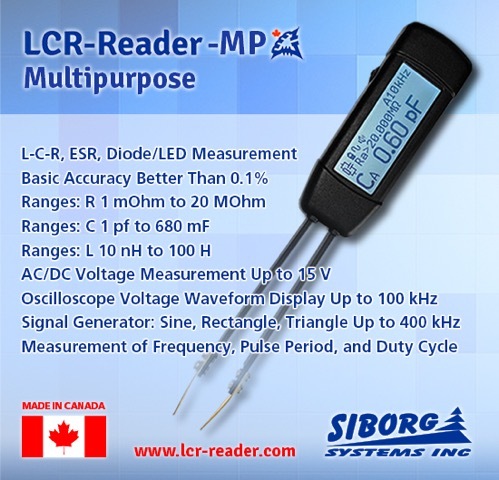 In late 2017, Siborg released the LCR-Reader-MP. 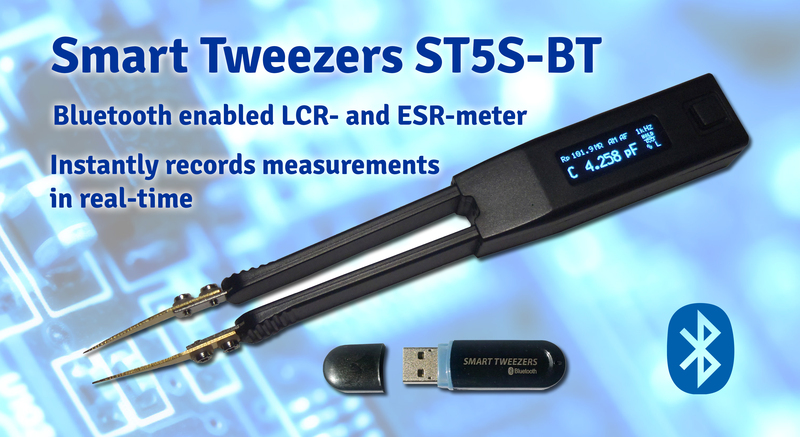 This device delivers 0.1% basic accuracy and the more features than any other Smart Tweezers type of devices to date. Controlled using a jog-wheel, users can change the test modes and test frequencies from the default settings; pressing the wheel enters the extensive menus for more customization. Some of the features on MP include Oscilloscope mode, signal generator, LED/diode measurements, Continuity testing, AC/DC voltage measurements, pulse counting, super large capacitance measurements, automatic voltage reduction for in-circuit measurements, and more. One of the main features is the ability to test at 100 kHz test frequency, which gives a 0.01 pF resolution for capacitance and better than 1 nH resolution for inductance. The Large Capacitance Test Mode tests large and super capacitances up to 680 mF using a wider range of test frequencies. The MP will automatically reduce the test frequency to 25 Hertz while using the Large Cap mode, allowing for better accuracy. Caps larger than 40 mF are testing using DC. When testing electrolytic capacitors, the MP will measure at 120 Hertz while ESR values are measured at 100 kHz according to standard electrolytic capacitor test conditions. The MP’s Oscilloscope mode allows for analyzing waveforms with frequencies up to 100 kHz on active circuit boards at various nodes on the PCB. This mode is especially useful when used in conjunction with the LCR-Reader Kelvin Probe Connector (KPC). The KPC turns MP, LCR-Reader and Smart Tweezers devices into a low-frequency probe station; it comes with 5 attachments, including spade connector, multimeter jack plugs, alligator clips and two sizes of pin-probes. 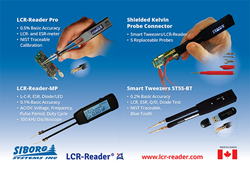 LCR-Reader was released in 2013 as a lower-priced alternative to the Smart Tweezers line of LCR-meters. The lower price point was achievable by removing some features, like test frequency selection, and offering a slightly lower basic accuracy of 0.5%. Later Siborg created a new calibration fixture for LCR-Reader that allows the creation of NIST traceable calibration certificates. This device is extremely reliable and easy to use that makes it very suitable for educational usage in high-school and university labs. Siborg offers a wide range of SMT test devices, including Smart Tweezers, LED tester, test tweezers and the Kelvin Probe Connector. Smart Tweezers are the original tweezer-probe multimeter. The most recent mode, the ST-5S, offers users extensive settings and a 0.2% basic accuracy. A Bluetooth enabled model of ST-5S is also available which offers the extra ability to remotely record measurement values over a virtual connection. PC, Android and iOS devices are able to receive the measurement data through a variety of programs, including NI LabView. All sent data can be saved into a file, spreadsheet or database. A new update allows the ST device to both send and receive data, including custom profiles in which components must meet specific parameters to be granted a pass by the receiving program. Kelvin Probe Connector: a shielded two-wire extension kit with 5 different attachments. The connector is compatible with LCR-Reader, LCR-Reader-MP and Smart Tweezers devices. It can be used a full probe station and allows to measure components larger than the tweezers’ gap. LED Test Tweezers test LEDs with a 12 VDC output and adjustable current ratings. It can also test small components and circuitry. 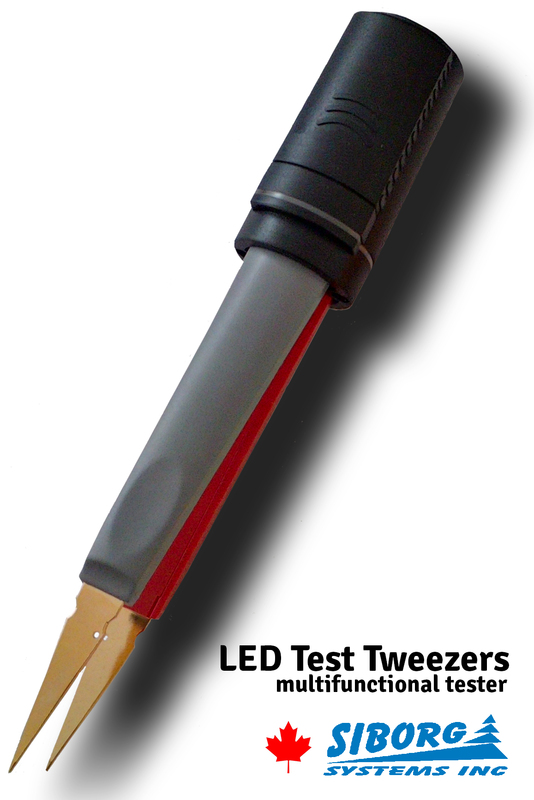 Using an included cable, the LED Test Tweezers can be used as tweezer probes for most multimeters. SMD Multimeter Test Tweezers are low-cost tweezer probes for most multimeters with 4 mm jack plugs. The device will add tweezer precision instead of using long leads but is not for high-accuracy tasks. The LCR-Reader-MP and LCR-Reader Sale will begin Monday June 25 in the LCR-Reader Store. 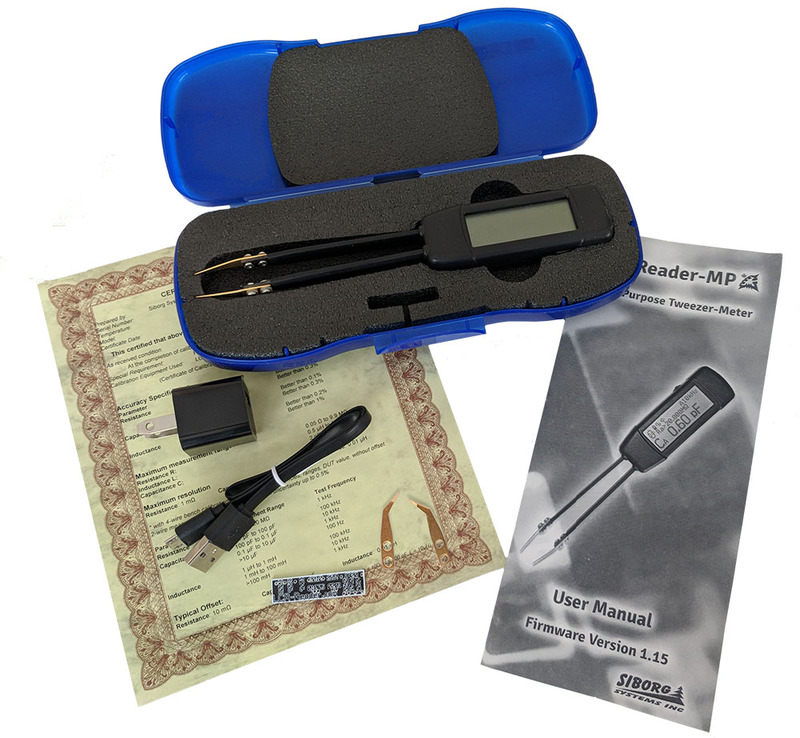 The store also offers accessories for LCR-Reader and Smart Tweezers devices, other SMT testing solutions and pre-bundled task kits. Established in 1994, Siborg is a source of engineering hardware and software tools for the semiconductor and electronics industry. Located in the city of Waterloo, Ontario, it enjoys being a part of the local world-renowned high-tech community.